Every year when Roll up the Rim rolls around at Tim Horton’s, there are people who seem to win left right and centre. There are all sorts of people collecting up the donuts and coffees, taking home the cash…The caretaker in my office sat at a sports game a few rows behind a guy who won one of the few big screen TVs. Those little paper cups are tiny little potential goldmines of elation. Some people even collect them to redistribute to the homeless, and apparently there is much debate raging about whether British Columbia and Alberta have been unfairly advantaged in their odds of winning the grand prize. But let me tells ya, a free cup of anything is just about cause for celebration, as is the soothing mostly-stockinette of my Climbing Vines Pullover (zipping along nicely – another weekend should complete most of it). I’m on the homestretch of my heaviest teaching semester ever, and folks, I’m flagging. I’m close enough to look out and see the end, but not so close that I don’t still have lectures to write or that I can just imagine away the mountain of grading that still waits for me. It’s a long treadmill that will certainly be a little easier the next time I get on it, but still. No getting around it, I’m tired. Me and my free cup of tea, we’re going to clutch the cheerful green Climbing Vines Pullover on the bus today, and add things to the “Things to do in April When I’m Done Teaching” list. It’s helping a lot. What knits are you dreaming of? And have you ever rolled up the rim and won? Happy Tuesday, my imaginary knitting friends – here’s hoping Friday comes soon! Hang in there – you are really pretty dang close! And at least you have knitting and tea as comfort friends! I think there’s nothing like soothing stockinette to help get through a rough patch. I forget between-times how much I like to “just knit” – but I’m really enjoying my stockinette cardi right now. Makes me sort of happy to be unemployed right now! I am dreaming of knitting miles of lace, kilos of ganseys and socks sufficient to keep a millipede happy. No particular order. I like the phrase “imaginary knitting friends!” Very cute…. I am curious, what do you teach? I am sure that I missed it, but I am relatively new to your blog…. And enjoying it very much! I wish they did something like roll up the rim in the US but, I can’t see starbucks doing that. I live in central Ohio and am enjoying the “roll of the rim” time. My first “roll up the rim” cup this year was a free coffee, but nothing since then. I swear that a few years ago about every other cup was a winner. I’m praying for the $10,000 or a TH gift card! I can’t believe I get suckered into it these days… it’s so silly… I’ve got tea-making stuff at the office… sigh. But yay for your free tea! And wow, your sweater is gorgeous! I love the pattern, and the colourway is just awesome! Canada has five seasons, I say. Summer, fall, winter, spring and Roll Up The Rim To Win Season. I heart Timmy’s…. gosh, I miss it down here in Philly. When my mom was a kid she won a donkey in a drawing. A real live donkey! That’s the sort of contest you get in small farming towns in the middle of Kansas in the post-war era, I guess. The animal was completely useless in every way…I’m not sure what they did with it after that. Sold it? Gave it away? Let it free in the wild patch by the crick? Yes, imaginary internet frineds, I ahve those too. My word, the whole rim of the cup thing is very big!! Happy cup of tea!! I am quite unlucky with winning things. The CVP is looking very nice as well. 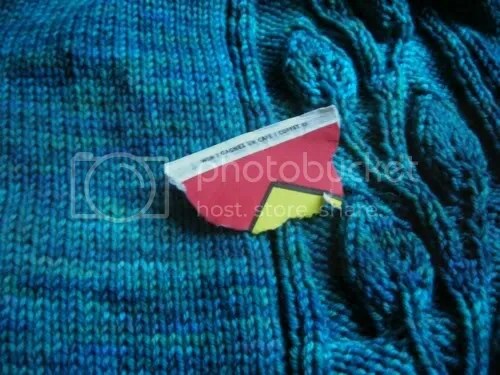 I am looking forward to knitting something new, maybe the Decimal cardi, or my vest with Dalek on the front!!! I have never won. Ever. People around me win all the time though, and I even bought a bunch of those rimroller things for my officemates. Its fun even when its actually a bit of a joke that I never win. As far as I’m concerned they all say “Please play again”. I love Roll Up The Rim. Forgot they started it up again. Will have to go in to get some tea! We don’t have a lot of those competitions here in Denmark – usually you have to text message a number something like twenty times a day at an obscene amount and you might win a big screen TV. I’ve never participated in any because, well, I have to pay rent. Right now I’m dreaming of a weightless shawl for my MIL (but the knitting pleasure will be mine!!) and a cotton or silk or other summery fibre tank or cardigan. But for some reason, all I look for online is wool…. Alas, there are none around here. I’m dreaming of finishing Abby cowl from Knitty and making another cashmere moebius cowl, some light scarf patterns from Morehouse Merino, a drop stitch scarf, croched Queen Anne’s lace scarf (if I can remember how to crochet) and some knitted Easter eggs. A student at Ryerson University won $10,000 or as the article stated “student wins tuition”. What a great win. Oh Mercy, your Climbing Vines is GORgeous, what colours!